На основе M.3B Falcon Six спроектирован M.7 Nighthawk; построено пять гражданских самолетов. Трехместный M.7 предназначался для использования в качестве учебного и связного самолета. Затем, согласно спецификации 38/37, Министерство авиации заказало вариант ДальшеMore>>> самолета M.7 под обозначением M.16 Mentor - для использования в качестве связного. Mentor также предназначался для тренировок летчиков в полетах по приборам днем и ночью. Самолеты оснащались двойным управлением, радиостанцией и посадочными фарами. Прототип выполнил первый полет 5 января 1938 года, он получился тяжелее первоначального M.7, но, тем не менее, успешно прошел летные испытания, после чего поступил заказ на 45 машин. Поставки завершились в середине 1939 года. Подобно самолету Magister, Mentor был оборудован противоштопорным дестабилизатором. После завершения программы испытаний прототипа на самолетах стали монтировать узкие рули направления, как у Magister. Войну пережил лишь один самолет Mentor, в 1947 году его продали гражданскому оператору, самолет разбился 1 апреля 1950 года. Силовая установка: один мотор жидкостного охлаждения de Havilland Gipsy Six мощностью 200 л. с. WITH an eye constantly on the market for training aircraft, Phillips and Powis Aircraft, Ltd., have lately put into production a new monoplane known as the Nighthawk and intended for tuition in instrument flying and night flying. The new machine is likely to interest clubs which have been approved by the Air Ministry for blind-flying training, air lines which are undertaking the instruction of their own personnel, and schools which obtain training contracts from air lines. The Nighthawk is believed to be the first cabin machine in this country equipped specifically for giving instruction in instrument flying. Basically, the machine may be regarded as a derivation of the Falcon. The first two to have been built are fitted with the 200 h.p. 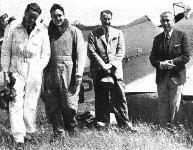 D.H. Gipsy Six, but the 130 h.p. Gipsy Major is an alternative power plant. Structurally, the machine follows standard Miles practice; that is, it is of wood with a box-type fuselage and two-spar wings with plywood covering taking the drag and torsional stresses. Side-by-side seats are provided for the pilot and pupil; there are dual controls, and either half of the cabin can be shut off from the other by an ingenious hood which “blinds” the pupil to everything except his instruments. When this hood is in use the view from the instructor's seat is still adequate, and his range of vision extends right across the machine. The hood which covers his head is divided at the front and secured by press studs; when he wishes to emerge from it he undoes the flap and slides the whole hood back on rails. In order that instruction may be given in all types of controls as fitted to various machines, three alternative forms of control may be installed. One is a central column which can be operated easily by either occupant, the second is a "Y" type column, and the third, also of "Y" formation, is provided with wheels for aileron control. The seats are arranged to take seat-pack parachutes, and the exits have been designed with a view to quick release in an emergency. Behind the seats a large space is available and might be used for camera equipment, wireless installation, and drift or bomb sights. Actually, the all-up weight permits an extra pupil to be carried behind the instructor, where he could take notes of mistakes made by the learner in the front seat. The blind and night-flying instruments, of course, are duplicated, one set being on each side of the instrument panel. 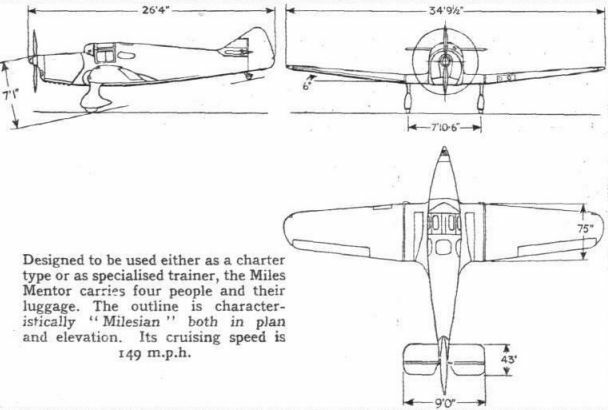 The leading edges of the wings contain Harley landing lights (which can be pivoted and rotated from the cockpit), and the trailing edges have Miles hydraulically operated flaps to give a steep angle of approach and low landing speed. Normal navigation lights are fitted. 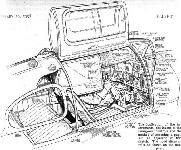 The undercarriage is of conventional Miles design with ball-bearing wheels and long-travel legs and incorporated the "trousers" which have become standard on Miles designs. The following performance figures are obtained with the Nighthawk fitted with the Gipsy Six engine : Maximum speed, 175 m.p.h. ; cruising speed, 155 m.p.h. ; climb to 1,000ft., 1 minute; stalling speed, 50-55 m.p.h. ; ceiling, 23,000ft. 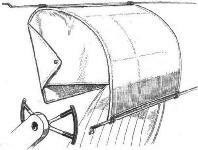 The new Miles Nighthawk has an ingenious arrangement of hoods by which the pupil is prevented from seeing the horizon, although he can see, and fly by, the instruments fitted to the dash. The instructor retains a very wide angle of view. In the spring the Nighthawk will become available as a luxurious four-seater. The doors of the Nighthawk are designed with a view to quick exit in an emergency. This is the prototype Nighthawk, with a Gipsy Six engine, prior to being tested by Mr. Miles. Miles Nighthawk G-AGWT part of Noel Collier’s happy memories of Woodley. 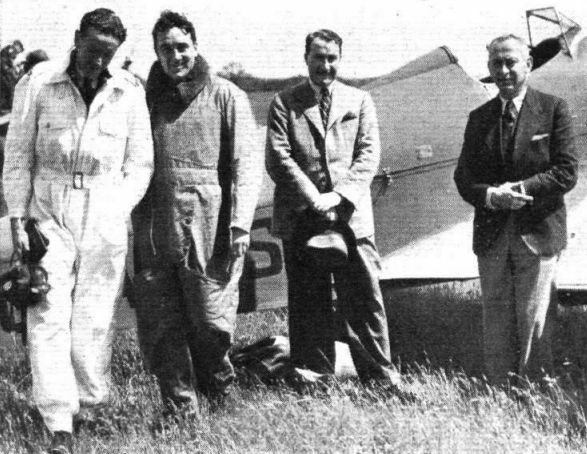 Hugh Kendall was the pilot for a 7/6d joyride! Учебный и связной самолет Miles M.7 Nighthawk спроектирован на основе Falcon M.3B Six. SPIN-STOPPING BY PARACHUTE: Mr. F. G. Miles has evolved a scheme, not yet tested in actual flight, for stopping a flat spin during the flight-testing of new aircraft by releasing a small parachute anchored to the tail of the machine. 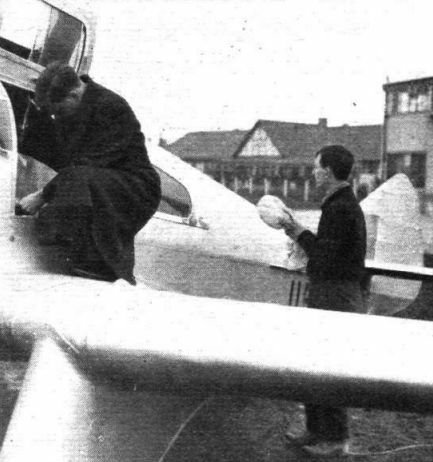 In this picture the parachute is being fitted on a Nighthawk. На момент начала войны в британских ВВС имелось 12 самолетов M.16 Mentor. Они использовались как учебные и связные в 24-й эскадрилье и некоторых других подразделениях. The duplication of the instruments, the layout of the swing-over controls and the method of screening a pupil are all apparent in this sketch. The hood slides on rails. 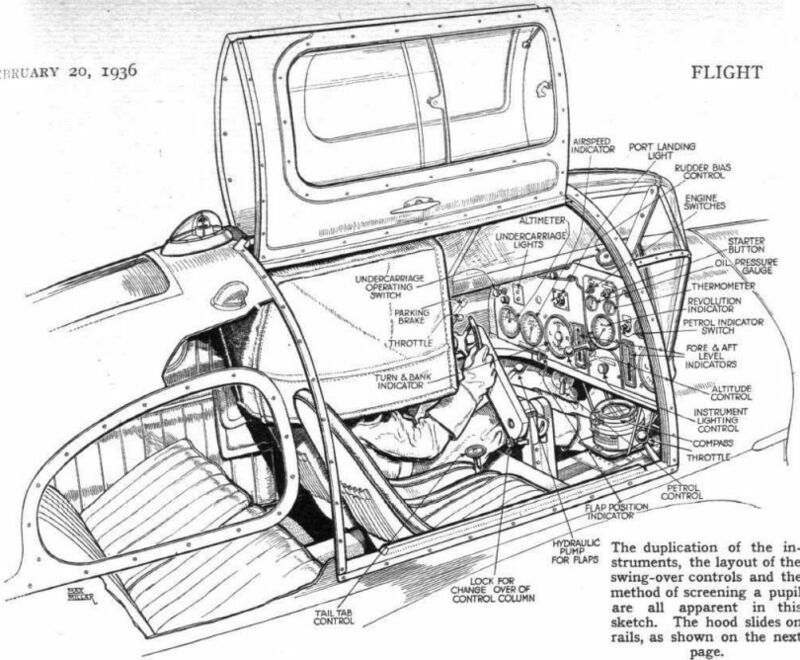 This Flight sketch shows the hood which can be unbuttoned and slid back. Designed to be used either as a charter type or as specialised trainer, the Miles Mentor carries four people and their luggage. The outline is characteristically "Milesian" both in plan and elevation. Its cruising speed is 149 m.p.h.